The daffodils are up, the very green, new grass is getting long…it’s spring! Phew, finally. Have you seen the new parking space counter for the HD parking garage? This will certainly help with parking in the HD…you can look at any given time and see how many spots are available in the garage. The counter has been up for just over a month, and the garage has yet to be full. At this moment, on any given day, there are parking spots for all. One thing that has come to the HD as a gift, is the willingness of Regional Transit to grant us free light rail rides into the HD on some event days. Only certain events are part of this program, so check the calendar for the events that qualify. There will always be a qualifying postcard or email that will have to be shown, so look for those details where you see events advertised. My husband, his parents, and a 90 year old uncle rode light rail from Iron Point to the HD last December for the FHDA Tree Lighting event. It was so easy, and made their time at the event very easy…hassle free parking! The Folsom City Council has backed an ad-hoc parking committee to study and make some recommendations for a parking strategy within the HD. Thank you very much to the City of Folsom for the support on this issue. The parking issue in our HD will take some time to work through, but know that it is being focused on….a step in the right direction. 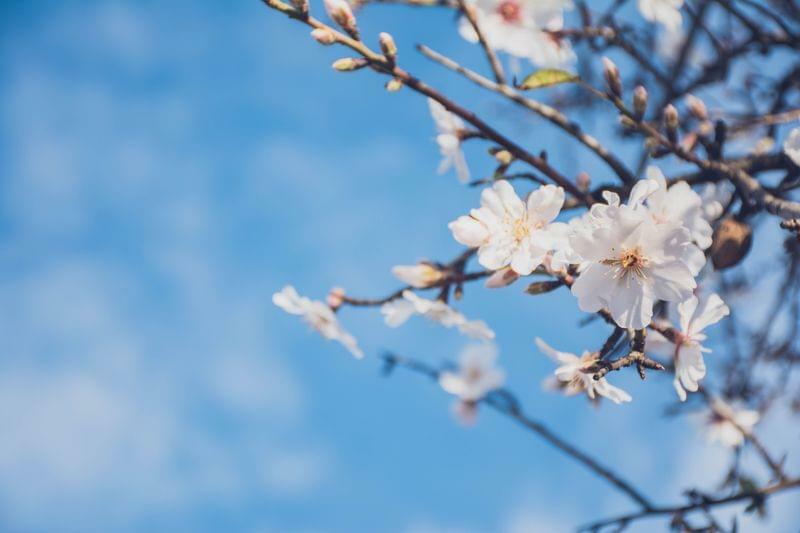 As spring gets underway, there are some wonderful events coming up. Sip and Stroll on April 6…this is a merchant-planned event, designed to showcase all the wonderful out-of-the-way nooks and crannies within our district. There will be wine, beer, and appetizers tucked into 25-30 preselected spots, for folks to wander and stroll within perhaps unfamiliar businesses in the HD. The event starts at 2:00 p.m., with folks strolling throughout the district until 5:00. If you think this sounds great, I’ll encourage you to keep your ears open for the next one, as this one is sold out, sold out, sold out. The organizers were thrilled with the response of our local Folsom community. It’s such a nod to the gem that the Historic District is. I am sure there will be a similar event in the near future. 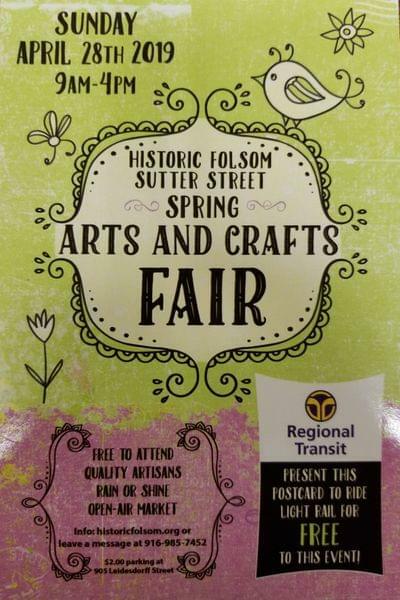 On April 28th the Spring Arts and Crafts Fair comes back to the HD. As it was with last year’s Craft Fair in December, there are so many vendors that they will spill off of Sutter Street and into the plaza. Lots of great crafts, people watching, dog watching, music playing, and a relaxed chill in the air. This one qualifies for free Light Rail rides, so park a bit down the road and ride RT right into the plaza….make sure you have a Arts and Craft Fair postcard, as it has the FREE RT Ride stamp on it that you’ll need to show the conductor. Have you heard about the events happening on May 4th in the Historic District? The day could not be more action packed! It is the 100th Anniversary of the dedication of Rainbow Bridge (1919-2019). The day will start with a re-dedication, speeches by Mayor Howell and City Council members, a marker dedication, and then a ribbon will be cut for the public to have access to the bridge for walking, picture taking, and hanging out….very special. Then….unbelievable! World class slackline walker (and Folsom resident) Ryan Robinson will walk a line that will be suspended from the Lake Natoma Crossing Bridge, over the top of Rainbow Bridge, to the truss bridge (a total of 1919 feet-great coincidence!) for a bridge-to-bridge record, and for a thrill to all of who have found a place to watch. It will be a thrill for all of us and a great time to marvel in our special city. After Ryan is finished, the bridge will close for a bit of cleanup/setup. 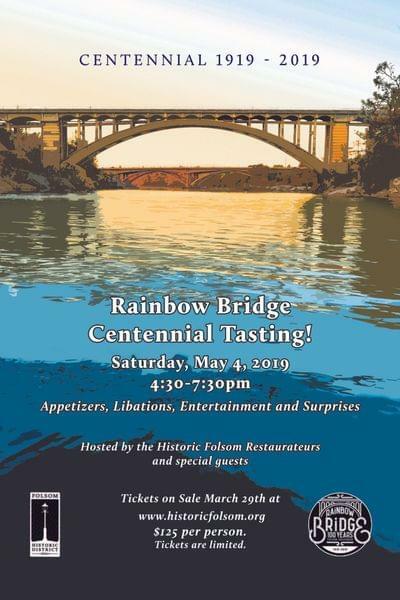 From 4:30-7:30 FHDA will host Rainbow Bridge Centennial Tasting…a three hour event featuring passed appetizers, entertainment (a piano on the bridge! ), beer and wine tastings, and an opportunity to watch the sunset from a never-before-granted location. The tasting portion of the day is a limited, ticketed event (www.historicfolsom.org) so don’t wait too long before securing your spot on the bridge for this portion of the day. After this event concludes, the Folsom Symphony will be playing a free concert in the HD amphitheater beginning at 8:00 p.m. This is the second year that the Symphony has brought this event to us…it’s a special night and has many special guests. Once again, this is an event that Regional Transit will allow free rides into the HD, so make it easy on yourself by parking down the road and riding light rail in. Wow, the spring will bring so many good things to the Historic District…..come for one, a few, or all the special events! Cannot wait to see you. 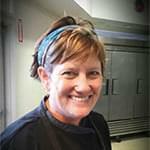 Karen Holmes is the President of the Board of Directors for the Folsom Historic District and the owner-operator of Karen’s Bakery. Scavenger Hunt In Historic Folsom Now Thru April 26!